Anthony Renard Foxx (born April 30, 1971) is an American politician. He was United States Secretary of Transportation from 2013 through 2017. He served as the Mayor of Charlotte, North Carolina, from 2009 to 2013. On April 29, 2013, President Barack Obama said he would nominate Foxx to be the Secretary of Transportation. 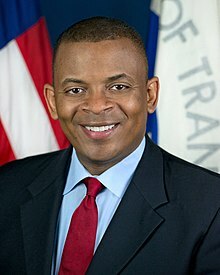 On June 27, 2013 the Senate confirmed the nomination of Foxx to the post of Secretary of Transportation on a vote of 100-0.